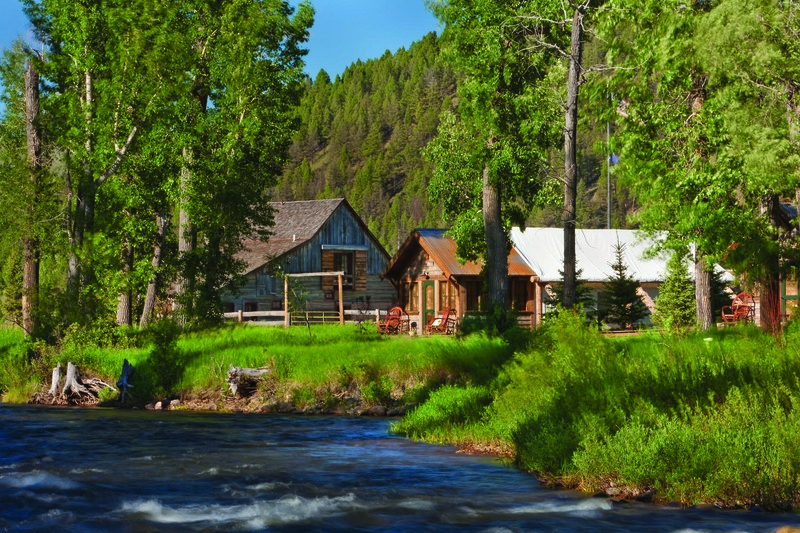 On a busy day at The Ranch at Rock Creek, near Philipsburg, Montana, the property bustles with families riding cruiser bikes from the main lodge down the dirt road (all guests receive a bike upon check-in during the summer), across the bridge to the Rod & Gun Club or to visit newly made friends at the glamping tents in Camp Roosevelt. The Silver Dollar Saloon swells with boisterous laughter and the crash of bowling balls at the private bowling alley. The summer afternoons fill with anticipation, as the cowhands get ready to rumble for the weekly rodeo down at the corral. But the day my husband and I visit, things are quiet. We have the ranch to ourselves on a spring afternoon when the staff is still preparing for the active summer season. 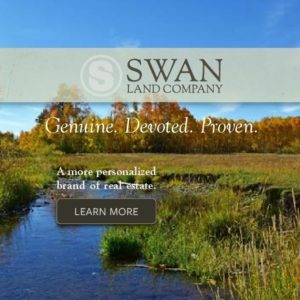 Considering it is a 6,600-acre ranch, encompassing 10-square miles of pristine country in western Montana and has the capacity to house about 80 guests, to some folks it might have seemed awkward, especially sitting in a vast dining room all alone over dinner. Yet the friendly staff at the ranch welcomed us so easily that instead it felt as though we were visiting long-time friends who happen to have a really large property. 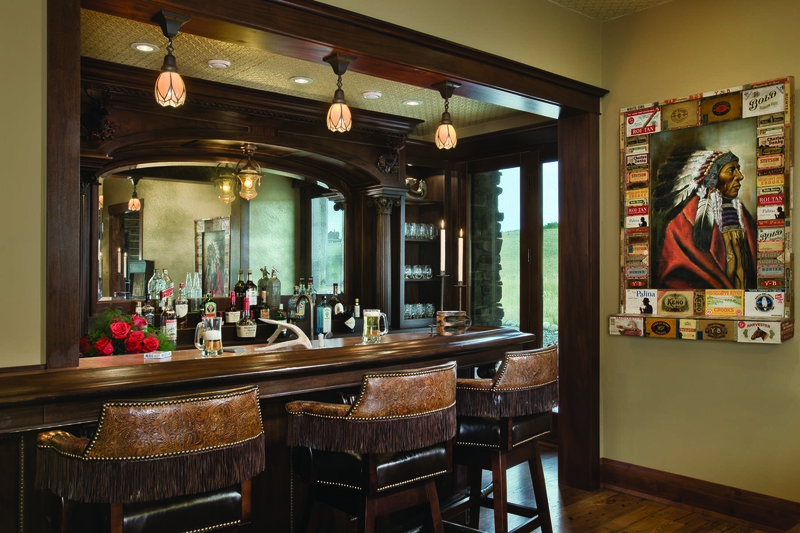 Part of this stems from the fact, that though the ranch is a member of the prestigious Relais & Châteaux luxury travel group and recently received the Forbes 5-star rating (formerly Mobil), the lodge, dining area and accommodations are so comfortably and personably designed that the ambiance is homey, more than ostentatious. Erase that image of steaks, piles of potatoes and baked beans. Chef Drage approaches the menus here with more finesse and a lot of thought. 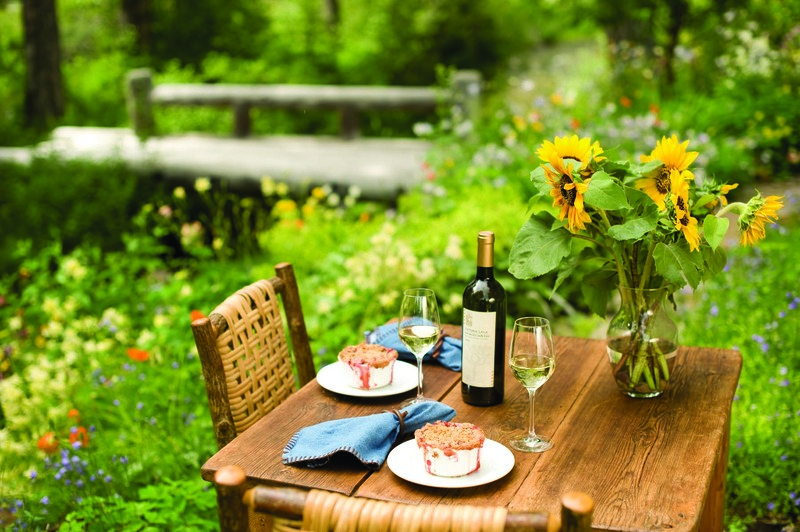 That means cooking with seasonal ingredients, incorporating Montana farm and ranch products throughout the whole year: ranch-raised lamb, beef and pork; fresh farm greens and tomatoes, potatoes, onions, squash. Chef Drage will fly in fresh seafood twice a week, but the trout is straight from a spring creek in Montana’s Paradise Valley. 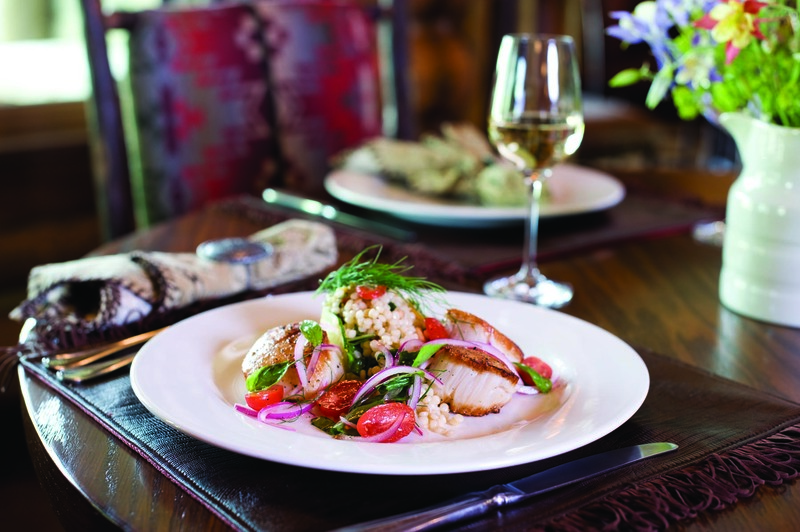 Knowing that the meals at the ranch are as much a part of the experience as the activities, Chef Drage changes the menus daily. 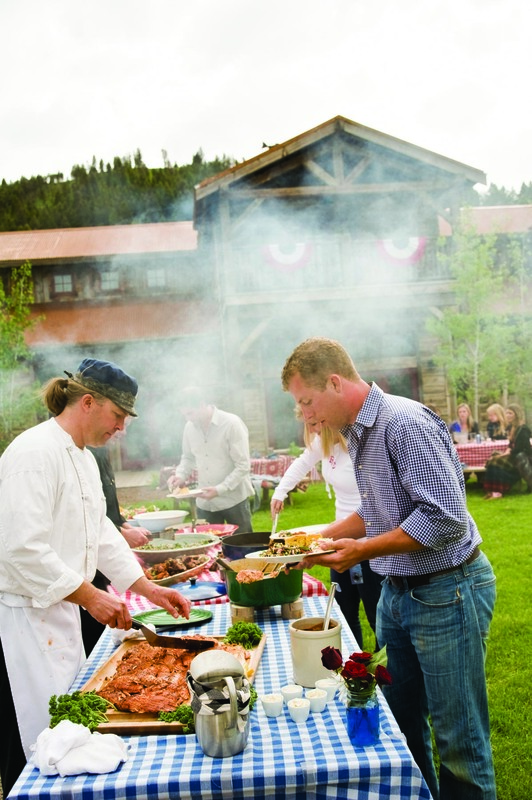 Each meal is an event all it’s own: One night is a Chef’s Grill, when bison flat iron steaks and juicy pork are given just the right amount of char on the outdoor grill. Another evening is a Dutch oven dinner of braised meats and vegetables, served over the open fire. Professionally trained in the culinary arts, Drage dazzles guests with the weekly Chef’s Tasting Menu, a five-course elegantly curated experience with a flight of wines to match. Of course there’s also, Ranch Night, when a meal of Tabasco-Buttermilk Fried Chicken, crispy onions and green beans is served family-style on red and white gingham tablecloths outside. Chef Drage knows how to keep things simple and still savory, never overly fussy. “Place should define cuisine,” says Drage. 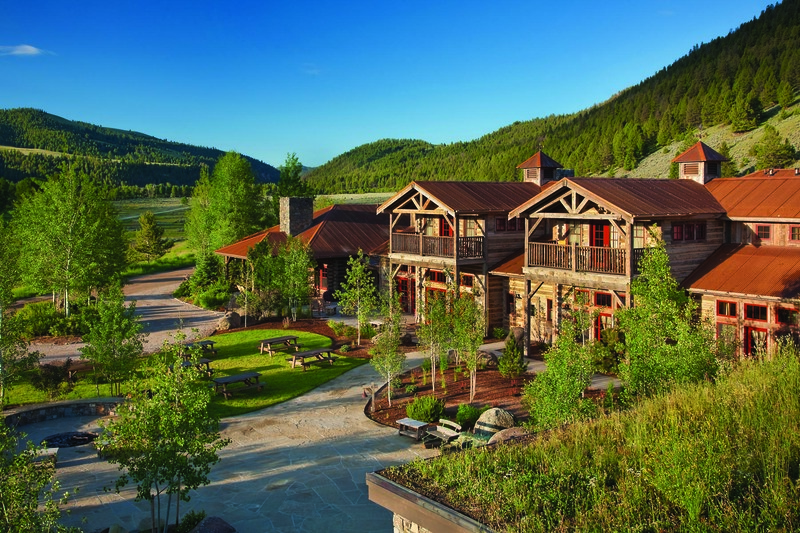 The ranch is an all-inclusive luxury experience with a slough of activities ranging from long horseback rides and fly fishing the blue-ribbon Rock Creek, or seasonal pheasant hunts and more adventure-travel offerings like paint ball battles, ropes courses and mountain biking. Most guests take in two activities a day (one in the morning and one in the afternoon). 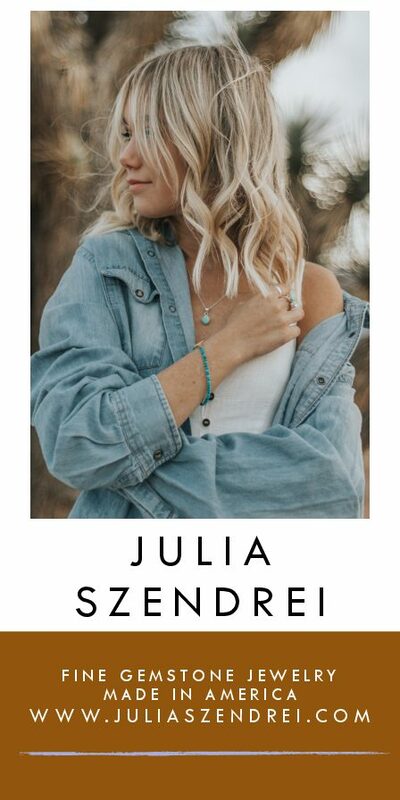 Some even add an extra dose of adventure, opting for a helicopter fly fishing or hiking trip into the high country of the Pintler Mountains. With so many offerings it’s tempting to cram in as much as possible in a short time. Wake up early to meet a fishing guide for a morning of trout stalking. Dash to the Blue Canteen for lunch, followed by a family feud on the paintball course. Gather at the barn for a ride to the “Top of World” where views of the Pintlers, Georgetown Lake and the distant Bitterroot Valley inspire awe, then down for a swim, spa treatment, exquisite dinner on the patio outside the Granite Lodge. After dinner, drinks and games in the Silver Dollar Saloon for a billiard challenge and a few frames of bowling, maybe watch a movie in the wee hours. All that’s possible, but the greatest challenge at the ranch is to shift into Montana time (even if you’re from here!) and slow down. The night we visited, Drage’s five-course Chef’s Tasting Menu helped slow our pace in a leisurely way. After handcrafted cocktails and appetizers in the bar, we were seated in the rustic dining room, with the twang of Country music setting the scene. Our server, dressed in a stylish gingham Western shirt made us feel at ease as the first course was served, a blend of local red lettuce and arugula with baby turnips and a drizzle of whole grain mustard vinaigrette, paired with a crisp Chardonnay. Lovely. Next was a plate of asparagus, puffed wild rice, a lightly fried quail egg, topped with a red potato crisp, accented by pickled Fresno peppers and a spring garlic fondue, all arranged as artfully as a still-life painting on the plate. What followed then were equally elegant renditions of the most perfectly cooked troll-caught salmon (crisp on the outside and flavorfully moist inside) and then tender bison sliced with fresh porcini mushrooms and ramps. To complete the experience, an extensive wine list represents every predominant growing region in the world. Then, of course, dessert, which was a memorable housemade raspberry ice cream with pineapple upside down cake and hazelnuts. While Chef Drage is capable of plates that are exquisitely arranged one night, the next he’ll dish up an equally delectable Dutch oven-cooked feast served by the fire ring. That’s the beauty of The Ranch at Rock Creek: Luxury isn’t just served up one way, but instead in a dynamic form that redefines the Western vacation. After all, life on the ranch doesn’t mean you have to rough it. 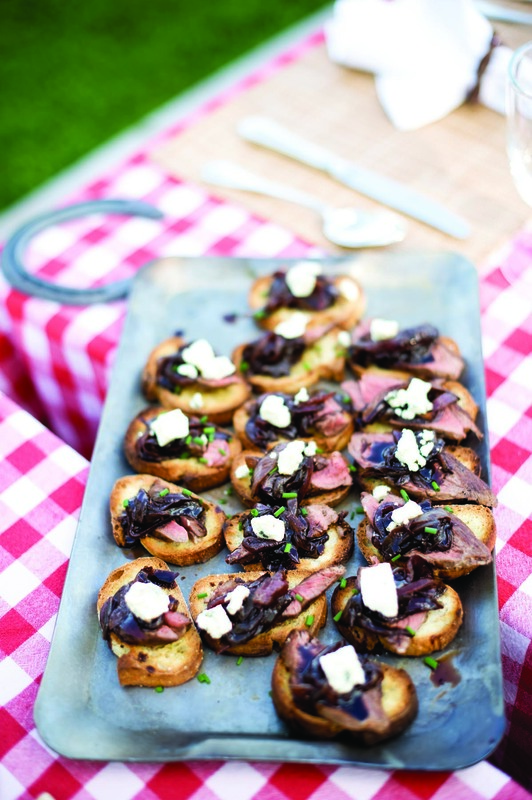 Planning ahead: Both the elk and the Puttanesca sauce can be done ahead of time and held in the refrigerator a day or two before serving. Puttanesca Sauce: Put the olive oil in a broad saucepot and add the chopped shallots, garlic and onion. Cook over high heat just to soften the flesh but not to really brown. Add the anchovies, stir in allowing them to melt, about two minutes. Add the tomatoes to pan and continue cooking for about a minute; deglaze with white wine and reduce by half. Add the tomato base, olives, capers, roasted red peppers and chili flakes. Simmer over a low heat for 30 minutes. Turn off the heat, chop and mix in the fresh herbs and serve. 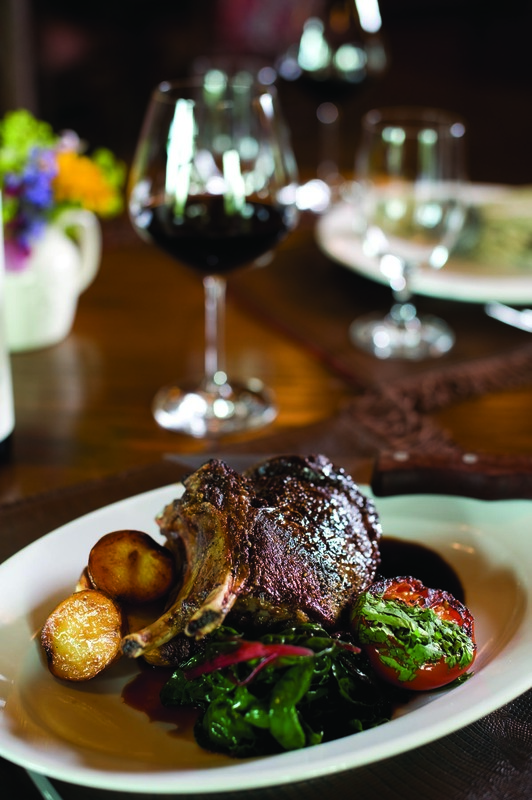 Braised Elk Shoulder Roast: In a Dutch oven, brown the sides of the roast, remove and deglaze with red wine. Add the roast back to the pot along with everything else except the stock. Fill the Dutch oven with stock until the level of liquid reaches two thirds of the way up. Cover and cook for about 6 hours on a very low heat of 250ºF degrees. Roll the roast every so often, plus check the level of liquid — readjusting the level if necessary — so the roast does not dry out. Uncover and cook for another hour, rolling the roast in the pot. When the meat easily pulls apart, it is done, even if that happens before six hours. Crispy Eggplant: Make an egg mixture by whisking the eggs and milk together. Standard breading procedure is to take the item being breaded first into flour then into the egg/milk mixture and then into the breadcrumbs. In this case do so with slices of the eggplant about a one-half inch thick. Once you have all of your eggplant breaded, brown the outside in a pan with a fair bit of olive oil in the bottom. If you apply color on medium heat, it will be richer and also cook the eggplant all the way through. Season with salt and pepper. To serve: Remove the elk from the cooking liquid and cool, tear the meat apart into about 3- to 4-ounce pieces, removing any unwanted parts. Reduce the cooking liquid until it becomes thick and rich. Add a portion of this to the puttanesca sauce, melding the flavors. In a large straight-sided sauté pan, lay the elk portions in the puttanesca and bring to temperature. Once all is hot and the eggplant is done, layer on a plate, first the eggplant and the Puttanesca sauce, topping it with the elk. Shred a bit of Parmesan Reggiano and add more fresh parsley, marjoram or basil. 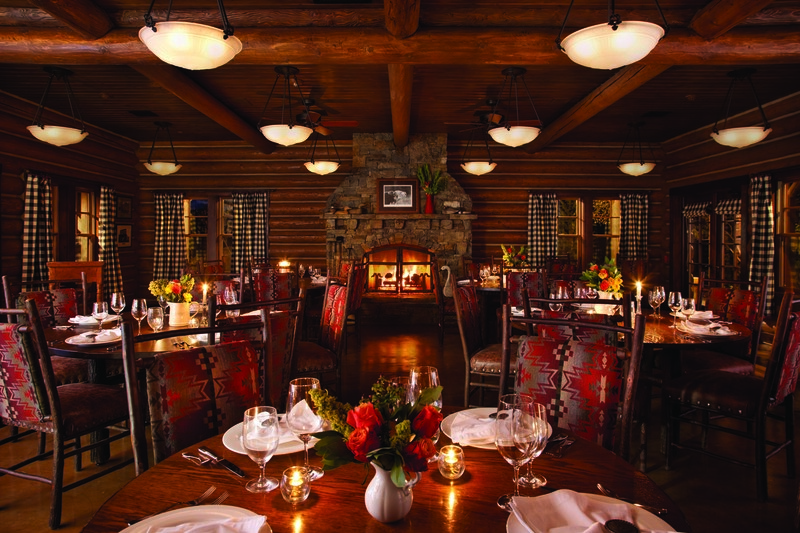 The main dining room inside the Granite Lodge at The Ranch at Rock Creek exudes rustic elegance. With interior design by Jet Zarkadas, owner of the Santa Fe-based firm, Los Griegos Studio, the charm of reclaimed wood and logs paired with Pendleton blanket-inspired upholstery and a cozy fire, the room is welcoming and authentically Western.